Subscription to our quarterly catalog, available as a hard copy or online only! More information here. 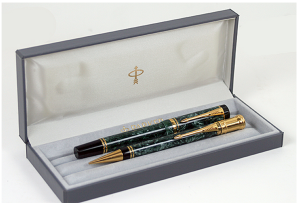 Glass top display cases to display your pens, and/or to store them and protect them! More information here. Vintage protective pen shipping tubes, great for storage of your pens at home, and for shipping. Keep a few on hand for convenience! More information here. Pen slotter boxes – accommodate a variety of pen sizes, but are great for display, for setting up storage in your drawers or cabinets, and for travel! More information here. Slotted display tray liners – available in several colors, and full size is 24 pens. They can be cut to fit your needs! More information here. Whether you are a pen lover, collector, new to the hobby, or an experienced user, we wish you a very inky December, Merry Christmas, and a Happy New Year!